A roof is an integral component of a building – it provides structural support in addition to protection from the elements of nature. 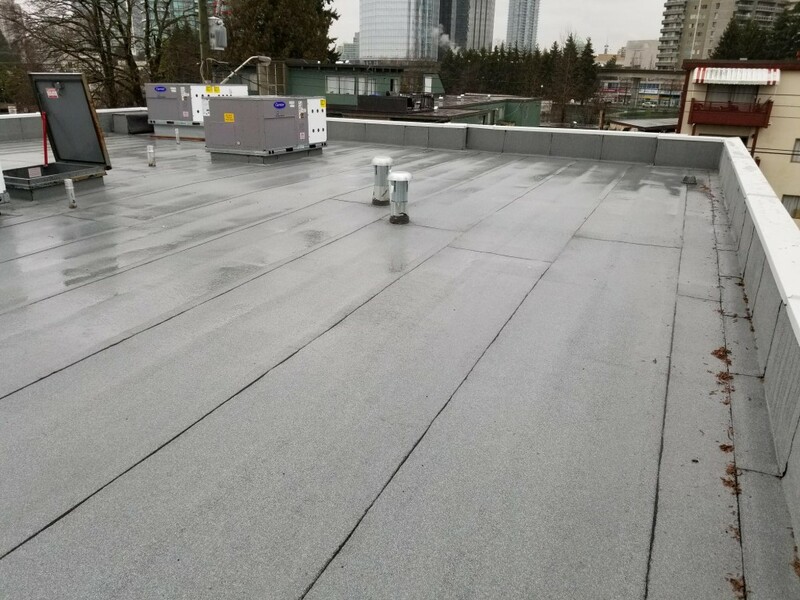 Because of the critical functions roofs serve, it is vitally important to properly maintain commercial roofs and to replace them when necessary. While there is no one-size-fits all estimate for commercial roofing costs (regardless if you are talking about repair or replacement), there are some predictable factors that drive commercial roofing costs in British Columbia. When you are trying to understand commercial roofing costs, it is important to consider the type of roof, access to the roof, underlying roof structures, and the local climate. First and foremost, one of the main factors that influence commercial roofing costs in British Columbia is the type of roof. Generally, a commercial roof will be a flat roof or a sloped roof. Depending on the type of roof then, you will have a range of materials that can be used in construction. Flat roofs are usually single-ply roofs or built-up bitumen roofs. Sloped roofs are constructed from a wider range of materials including asphalt shingles (though slate and wooden shingles are also common), barrel tiles, or metal. Let’s take a closer look at the costs associated with materials for commercial roofs construction. Single-ply flat roof replacement averages about $4 per square foot. Single-ply roofs are usually less expensive and labour intensive to install, yet they still offer suitable durability with warranties of up to 30 years. Built-up bitumen roofs average around $5 per square foot. These roofs feature multiple layers but are more expensive. Asphalt shingles average around $5 per square foot and are among the most common sloped commercial roofing material. Though other shingles such as clay, tile, or wood are available, they tend to be more expensive. Barrel roof tiles can be quite expensive, as much as $20 per square foot. Still, for sloped roofs these roofs last among the longest – up to 50 years. Metal roofs cost on average $9.50 per square foot. There are many benefits to metal roofs: they are durable, available in many colours, and function effectively in a variety of climates. Other factors that influence commercial roofing costs are roof access, underlying structures, climate, and building codes. For example, transporting materials to the roof of a taller building ultimately costs more. Likewise, roof components such as insulation, cover board, and even the structure of the deck of the roof will impact roofing costs, particularly if some of these components also need to be repaired or replaced. The climate of your region will guide the materials used for your roof – so if your roof must withstand harsh climates, expect roofing costs to be higher.